I shouldn’t even be here. By that I mean on this earth. When I was born, I did not breathe for roughly 40 minutes. The chances of an infant surviving this is zero percent. I believe God is using me for His good. Due to the oxygen deprivation, I have severe cerebral palsy which just affects me physically. Throughout my life I was told that I would never achieve my goals and dreams due to my disability. My high school teachers basically had me sentenced to life in a group home with me doing a boring, to me at least, computer job because I taught myself how to type with my nose at roughly age nine. Dealing with having my dreams and goals continually dismissed and being verbally abused every single day during all four years of my high school career was quite tiring. I became a born again Christ-follower the summer after my sophomore year of high school. God helped me overcome depression as before that I was very depressed even though nobody knew it because I was good at hiding my true feelings. I know having my dreams and goals regularly dashed by almost everyone around me contributed to my depression. I was also dealing with family issues, physical, emotional, and verbal abuse by my dad and not being able to do what my friends were doing, which now I see was a Godsend as it prevented me from really screwing up my life. After receiving Christ, He let me ignore the naysayers and kept me fighting to ultimately do His Will. He is continuing to do so even though everything hasn’t worked out how I would have liked. I also still deal with emotional health issues but like my cerebral palsy, they do not define who I am. God continues to love me through this life. God has given me my wonderful husband, Chip. It was Chip that also gave me the courage, and continues to do so, to be who God wanted me to be…To be myself. Chip was was a friend of our family so that’s how we met. We dated for 4 and a half years before getting married April 12, 2003. Without him, my book, Gentle Firmness would not exist. So, what led me to write a 500 page book with my nose? God, of course. You see, ever since I was a child, I have had a deep love for young children. They, especially infants and toddlers, have always fascinated me. 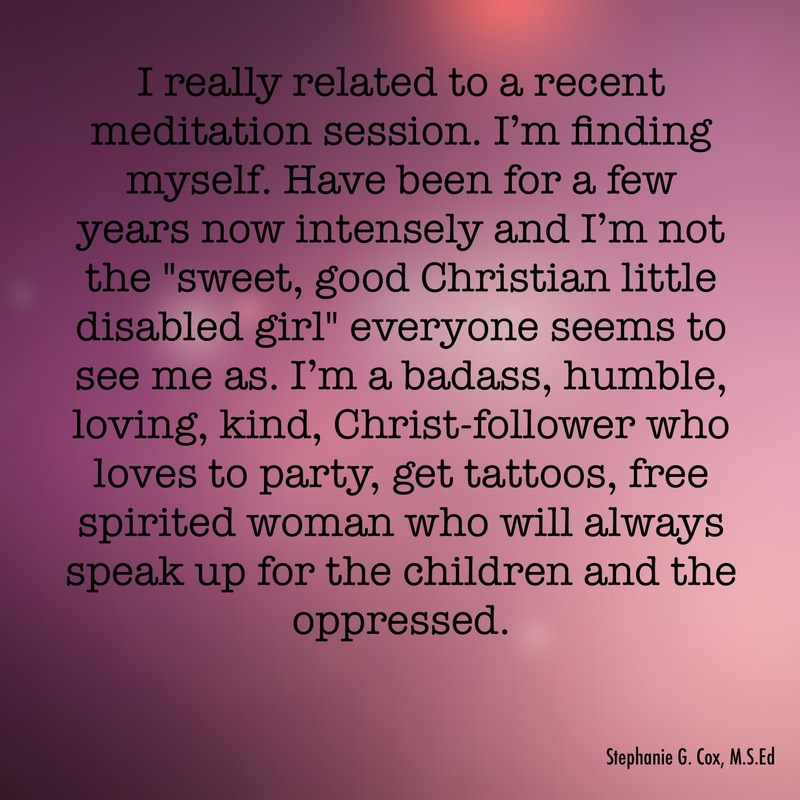 Being severely physically disabled, I would sit in my wheelchair or lie on the floor and observe and interact with infants whenever they were around. I still do. I believe that I have been given a gift by God to be able to see children as the beautiful, unique people that they are. My education is another reason why I wrote my book. I went on to get my Bachelor’s Degree in early childhood education from Southern Illinois University-Carbondale in August 2008. Then in December 2013 I again graduated with my Master’s Degree in early childhood education from SIUC. I typed all my papers, presentations, and Master’s Thesis with my nose. How did I survive and excel? With God’s amazing love and grace as well as the support from my husband. It was while working on my Master’s Degree that God decided to make things even more interesting by having me write a book. After becoming a born again Christ-follower, I studied the Bible, hungry to know God more. That hunger has continued, therefore, I have been studying the Bible ever since. With my deep love of young children, I have always struggled with the rod verses in the book of Proverbs that seem to advocate spanking children, because seeing how children react to being spanked, and knowing what I know about how young children learn, it just never made sense that God would want children to be spanked. For example, I saw the heartbreaking event of a wonderful Christian mother who truly wanted to do the best for her children, slap her toddlers hand for the first time because he kept touching something she didn’t want him to. It took a couple slaps before he confusingly looked at his stinging hand then at his mom to try to figure out why she hit him. I’ve also seen children “lovingly” spanked and still freeze up when they disobeyed. Interestingly, when positive discipline was used with these children, they cooperated. It was out of concern for these children and my knowledge of child development that made me question even more why God would supposedly tell us to spank when research and my own observations showed how harmful it was to children. I began doing intense, prayerful research into these rod verses. I read books and articles from Christian leaders and theologians on both sides of the spanking controversy. I tried to find other verses besides the well-known rod verses to try and back up the belief that spanking was indeed Biblical. I also spoke with many people who grew up in loving Christian homes and were “lovingly” spanked but were still emotionally scarred. I would spend hours upon hours dictating notes to Chip. Then I would take those notes and type each chapter on my laptop with my nose. God would reveal Himself to me so clearly. My husband Chip would read each chapter after I finished writing it, and he would be amazed at how different and deeper the chapter would be from the notes I had dictated to him. Needless to say, the deeper I got into this journey, the more I found that the Holy Bible does not support spanking children in any way. The Holy Bible does teach gentle but firm discipline for children, hence, the title of my book, Gentle Firmness. This book has been the best and hardest thing I have ever done in my life. My knowledge of Who God is has grown tremendously in writing my book. Jesus is my teacher. Another thing I learned and cover in my book is that if God truly wanted children to be spanked, there would be zero neurological, psychological, or spiritual harm done to the children. But research shows otherwise. Even so called “lovingly spanking” is very harmful. And if you are wary of research, many researchers are Christians. Also, Romans 1 says we can learn much about God by looking at His creation. All young children can be disciplined without punishment. I’ve worked with some difficult children. One tested me by continuing to throw sand out of a sensory table. After telling her a few times to keep the sand in the table because someone might slip and fall, she purposely did it again. I looked her in the eye and told her that she either leave the sand in the table or she would need to play somewhere else. She looked at me for a moment then decided to play somewhere else. I was prepared to have someone help her play somewhere else had she ignored me. Discipline is much different from punishment as discipline teaches and guides. Punishment inflicts pain in order to stop behavior. Some of the discipline strategies that work well are modeling, child-proofing, validating feelings, fulfilling the child’s physical and emotional needs, setting realistic limits and boundaries, helping children comply, giving choices, and using natural and logical consequences with children. In addition, using the Resources for Infant Educarers, also known as the RIE Approach, and the Attachment Parenting philosophy with infants starting from birth helps with discipline as you communicate with them before doing anything with them. For example, tell the infant, “I’m going to pick you up now,” and give the infant time to respond. This shows respect for infants. What sets my book apart from other Christian parenting books is that I discuss child development in great detail. Understanding child development is crucial to disciplining them appropriately. When we see that God actually created children to go through each developmental stage, we can figure out kinder, merciful ways of guiding them through each stage. The Bible says that children are blessings from God in Psalm 127:3. Yet, more often than not, they are treated as little “sinners” in need of the devil beaten out of them. Jesus says we are to be like children in order to enter the Kingdom of Heaven in Matthew 18. Jesus raised the status of children. I also discuss attachment theory in my book as God created infants to cry in order to communicate with us. Crying is never manipulative for infants 12 months and under. God always hears and comforts us when we cry out to Him. We must do the same for our children. 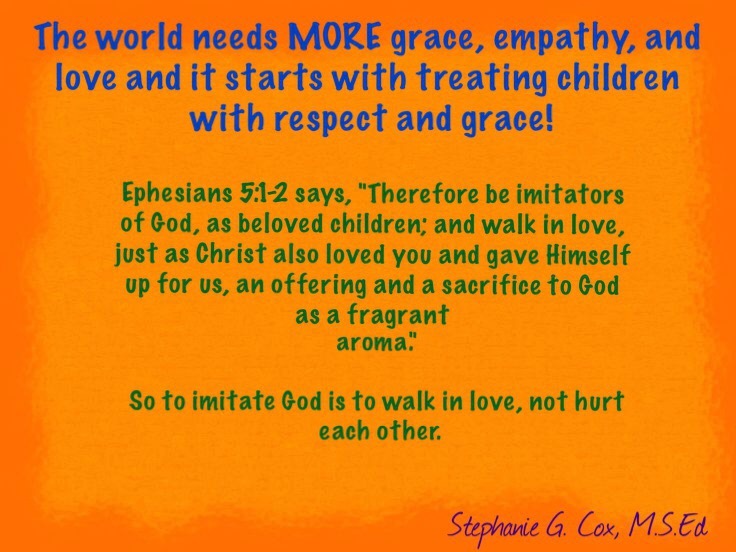 Another reason why I wrote Gentle Firmness is that every day, I talk with people that are rejecting Christ because they don’t want to worship a “god” that wants us to inflict pain on children. A pastor I know was renounced from his position because of teaching that God does not want children spanked but rather disciplined. It breaks my heart knowing children are being emotionally and physically hurt for no good reason. Jesus suffered a horrific death on the cross for the punishment for all our sins. He was sinless. What right do we have as sinners to punish our children for their mistakes? I am truly humbled at how God has chosen to use me. It is my prayer that everyone who reads my book and the upcoming 2nd edition of it will be blessed. I am a member of several professional organizations including Resources for Infant Educarers (RIE), The National Association for the Education of Young Children (NAEYC), Zero to Three, Attachment Parenting International (API), and subscribe to Exchange Magazine. I am currently working on my second book–a children’s book about my cerebral palsy. I hope to release it on Amazon sometime this fall. As I also said, there will be a second edition of Gentle Firmness released on Amazon in the near future.And I am now offering parent coaching.